Leaders from across the political spectrum condoled the demise of Nobel Laureate author V S Naipaul, with President Ram Nath Kovind terming it a 'loss for world of letters' and Prime Minister Narendra Modi saying, it was a major loss for the world of literature. Naipaul, known for his critical commentary on colonialism, idealism, religion and politics, died at the age of 85, his family said early on Sunday. He was the recipient of numerous honours, including the Man Booker Prize in 1971 and a knighthood for services to literature in 1990. Naipaul was awarded the Nobel Prize for Literature in 2001. 'A loss for the world of letters and for the broader school of Indo-Anglian literature,' he said. Madhya Pradesh Chief Minister Shivraj Singh Chouhan also condoled the author's death and said the world lost a genius. 'Deeply saddened to learn about the death of literary giant and Nobel Laureate Shri #VSNaipaul. He has inspired a whole generation of writers,' he said. 'In his death the world loses a genius today. Offering my prayers to the departed soul,' Chouhan said. Congress spokesperson Randeep Surjewala also took to Twitter to condole the death of the 'literary giant'. 'My condolences on the passing away of Nobel Laureate #VSNaipaul -- a literary giant and a modern philosopher who enthralled and influenced the world with his keen observations, creativity and often critical descriptions. May his soul rest in peace,' he tweeted. 'His works exploring colonisation, migration & unraveling of the British empire were exemplary & thought-provoking,' he said. 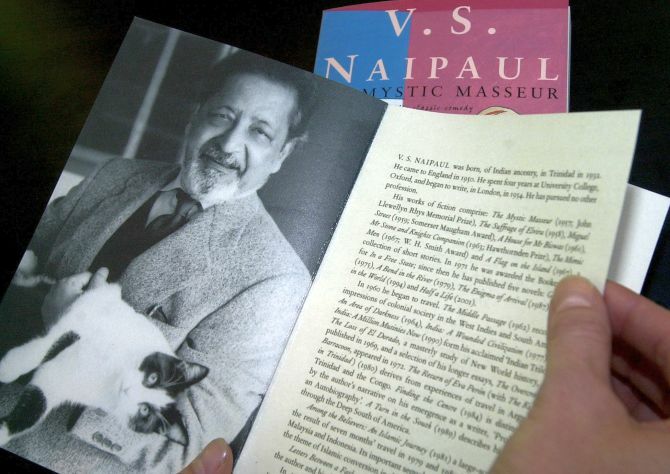 Rajasthan Chief Minister Vasundhara Raje said, "Deeply saddened by the passing of celebrated Nobel Prize author #VSNaipaul. His inspirational works on colonialism, decolonization and struggles in the developing world struck a chord with many." Sir Vidiadhar Surajprasad Naipaul was born on August 17, 1932 in Trinidad into an Indian Hindu family and moved to England at 18 after receiving a scholarship to University College, Oxford. He subsequently settled in England, although he travelled extensively thereafter. Naipaul married Patricia Ann Hale in 1955. After her death in 1996, he married divorced Pakistani journalist Nadira Khannum Alvi. Want to be a creative writer? This workshop is for you!